Inductoheat's accurately controlled, induction gear hardening systems provide specific metallurgical patterns, minimum shape distortion, increased wear resistance and contact fatigue strength. Inductoheat provides quality induction heating and heat treating equipment with flexible and innovative systems that offer long-life performance. At Gear Expo/Heat Treat 2011, the company will present its gear hardening systems. 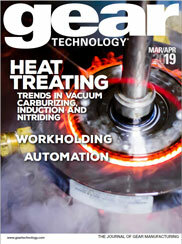 Just like gears, induction heating is all about precision. The company's accurately controlled, induction gear hardening systems provide specific metallurgical patterns, minimum shape distortion, increased wear resistance and contact fatigue strength. Inductoheat offers gear hardening patterns for flank hardening, flank and tooth hardening, hardening of the tooth tip, root hardening, hardening of the entire tooth, profile hardening (uniform and non-uniform) and flank and root hardening. Gears include spur, helical, bevel, hypoid, ring, worm, rack and pinion, planetary gear sets, involute, bearing races, idler, spiral, helical and differential. The company provides process development, metallurgical analysis, hardness pattern verification, single-coil dual-frequency technology, single-shot, scanning tooth by tooth and a large range of gear and bearing diameters. Additionally, Inductoheat offers the Single Coil, Dual Frequency Induction Gear Hardening System that can be used for high-volume, single-shot induction hardening of internal wide-face, gear-like components. The company has recently designed and built an induction heating system for medium and large gears that can harden the gear teeth or flanks, along with ball races.